I love to grill mushrooms, especially big white cup mushrooms. I’ll put them top-side down in a baking dish and drizzle them with olive oil, then balsamic vinegar. I will also pour into each cap a touch of worcestershire sauce, and a touch of soy sauce. If you have a basting brush, it makes it really easy to ensure that the tops (face down in the dish) and sides also get a coating. Let the mushrooms marinate for a good 30 minutes before you grill, and then grill on medium heat, flipping once or twice. Try not to cook these on a really hot part of your grill, because you want them to cook for about 20 to 25 minutes, and you don’t want them to burn. 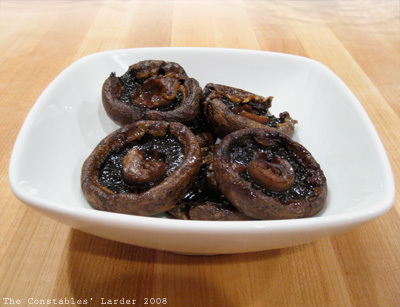 Your mushrooms will come out with a wonderful texture and rich flavor. Here is another quick recipe that I can’t quite remember where I picked it up, but it is an easy and delicious way to make asparagus. Wash and dry your asparagus, trimming the ends where they get tough. Place in a baking dish and scatter the tomatoes and black olives on top (I like adding healthy amounts of both). Drizzle olive oil across everything, and if you have more than one layer of asparagus (too many to fit on the bottom of the dish), then mix it all together a bit. Grind some salt and pepper on top and place in an oven set for 350 F. After 10 minutes, stir the dish again. Continue to check for when the dish is done, but my recollection is that it takes about 20 minutes. I have also added basil, a touch of white wine, or a touch of rice vinegar to this. I believe that this recipe originally came from a Gourmet magazine, which I adapted to simplify. It is rich and very delicious. 1. preheat oven to 400. Cook pasta in a large pot of boiling salted water for 5 to 7 minutes — you do not want the pasta to be fully cooked. Drain, then rinse under cold running water in a collander. 2. melt butter in a large saute pan over medium heat (I like to use a cast iron pan so I only have one pot to wash). Add onions, garlic, thyme, and rosemary (if used) and cook until onions are soft, 8-10 minutes. If you do not have fresh herbs, use a pinch of dried thyme. Add wine and cook for 2-3 minutes. Remove and discard the sprigs of herbs (if you used dried herbs, just leave in the mix). Whisk in flour and cook, stirring for 1 minute. Gradually whisk in milk then mustard. Reduce heat to keep the sauce at a gentle simmer and cook, stirring constantly, until thick and creamy (about 30 minutes). 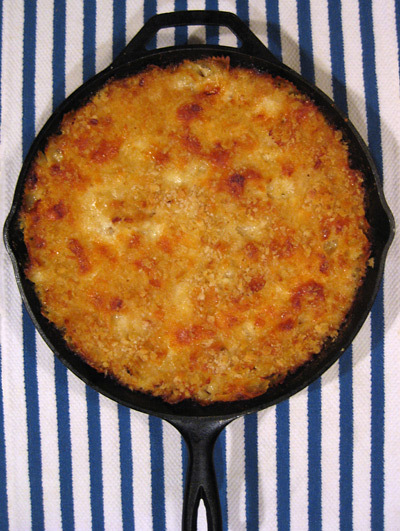 Remove pan from heat and stir in most of the cheese, leaving about 1/2 to 1 cup of cheese for the top. Stir in the cheese a handful at a time, stirring until completely melted after each addition. Season to taste with salt and pepper. 3. fold pasta into sauce and stir until well coated. If your pan is not oven-proof, transfer everything to a baking dish. Scatter the remaining cheese on top, then sprinkle with bread crumbs. Bake until crust is golden, about 25 minutes. 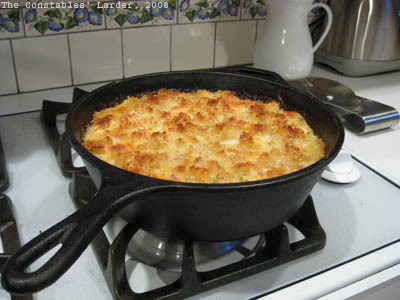 I prefer making this in a wide cast iron frying pan, but it also works with a narrower, deeper pot such as the above.